As I mentioned about a month ago, I am now the contributing writer to our monthly neighborhood magazine. I write the Resident Recipe section, and for the month of May 2012, we’re featuring a decadent tiramisu recipe submitted by my next door neighbor, Diane. My article is written below, as well as Diane’s instructions for the tiramisu. I hope you enjoy! Dine at any fine Italian restaurant, and more than likely you’ll see tiramisu on the menu. This elegant dessert, which literally means “pick me up” in Italian, is thought to have gotten its name from the caffeine in the espresso and effects of cocoa used in the recipe. While the dish itself is Italian, this particular tiramisu recipe, shared by our neighbor, Diane, has its origin and roots in Germany. When Diane and her husband Tom were first married, they were fortunate enough to live in Germany and travel throughout Europe. It was during these exciting times that Diane started appreciating food and its many delicious flavors. 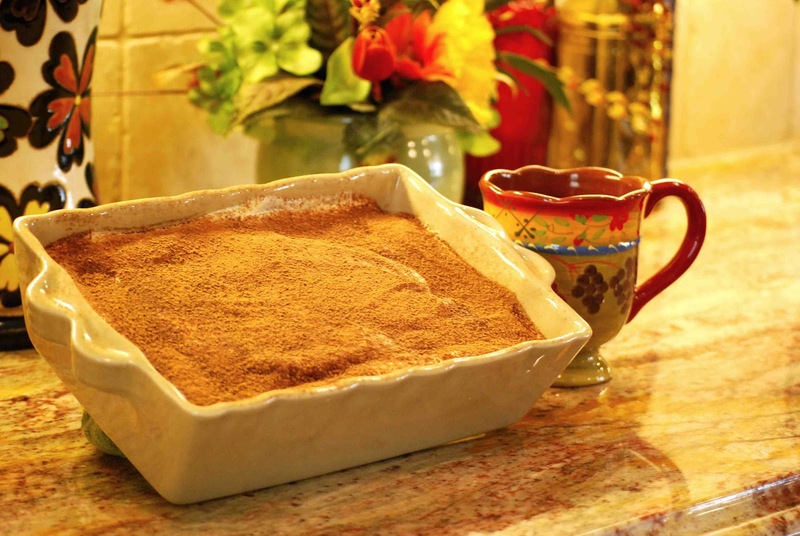 While living abroad, Diane met a German lady named Susanne who was gracious enough to share a family favorite: tiramisu. Now Diane is graciously sharing it with us! In this photo: Diane sprinkles cocoa over the tiramisu for a nice golden brown top. 1. Prepare mascarpone mixture by combining 3 egg yolks, ½ cup sugar, 1 Tbsp. espresso or coffee, and two tablespoons brandy in a large bowl. Beat with mixer 2 minutes until light and fluffy. Add mascarpone cheese and continue to beat for another 3 minutes until consistency is smooth. Set aside. 2. Combine 3 egg whites and a pinch of sugar in a separate bowl and beat with clean beater blades (works best in a glass bowl with cold, dry blades) until mixture forms stiff peaks. Gently fold egg whites into mascarpone mixture until well blended. 3. Pour some of the additional coffee out onto a saucer and lightly dip ladyfingers, one by one, as you layer on bottom of serving dish. Don’t dip in coffee too long, as they will get soggy. I dip the sugared side then turn over and place the wet side up so the coffee can work its way down through the ladyfinger. Spread half of the mascarpone mixture over the ladyfingers and sprinkle with cocoa until top is lightly brown. Works nicely shaken through a fine sieve. Repeat process with second layer and finish with cocoa. 4. Cover and refrigerate for at least 24 hours before serving for best flavor and consistency. Enjoy!